"when you operate in an overbuilt metropolis, you have to hack your way with a meat ax." 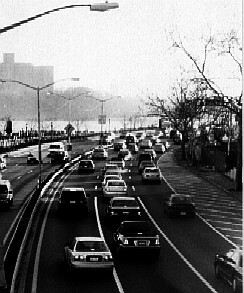 The expressway would begin at the West Side Highway as a six-lane elevated roadway. It would follow Canal Street about two blocks, then curve north and cross over the Holland Tunnel entrance plaza. East of the Holland Tunnel, the widened right-of-way would follow the north side of Watts Street, continuing eastward as an elevated eight-lane route along the north side of Broome Street. 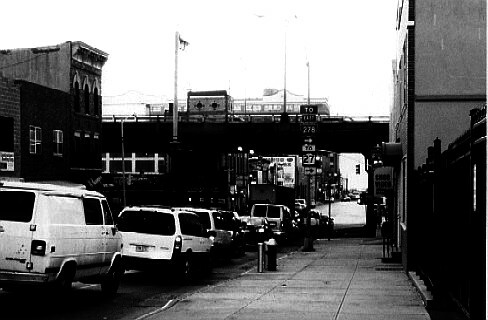 Near Centre Street, the outer lanes of the highway would descend and pass under Elizabeth Street, continuing eastward in an open-walled cut to the Williamsburg Bridge Plaza. 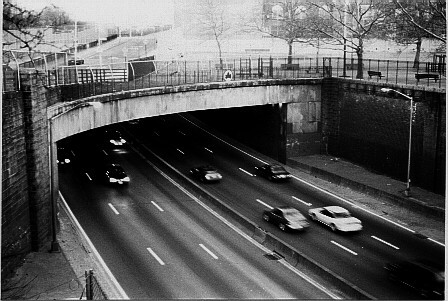 All streets except Mulberry and Mott would be carried across bridges over the depressed highway. At Suffolk Street the alignment would meet Delancey Street. 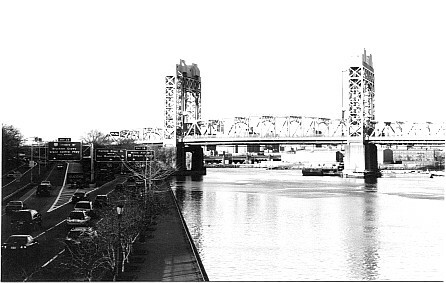 Near Elizabeth Street, there would be included an elevated spur to the Manhattan Bridge. This spur would cross the Third Avenue Elevated Rapid Transit structure (which was removed later in 1955) and parallel it along the Bowery, widened on the east side between Delancey Street and Canal Street. It would then turn southeastward to connect directly with both decks of the Manhattan Bridge. The estimated cost of the Lower Manhattan Expressway would be about $72,000,000, including about $28,000,000 for real estate." 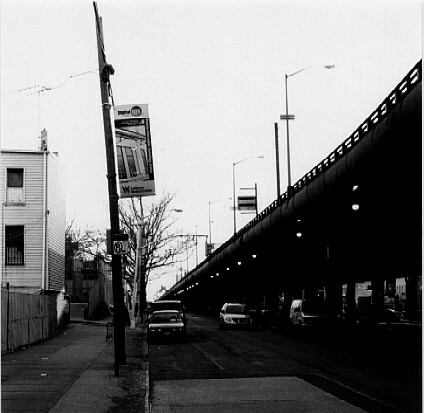 The elevated expressway was to have been constructed within a 250-to-350 foot-wide right-of-way, with a clearance of 50 to 60 feet between the edge of the expressway and the nearest buildings. "The route of the proposed expressway passes through a deteriorating area with low property values due in considerable part to heavy traffic that now clogs the surface streets. 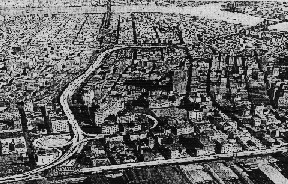 Construction of the expressway will relieve traffic on these streets and allow this locality to develop in a normal manner that will encourage improved housing, increased business activity, higher property values, a general rise in the prosperity of the area, and an increase in real estate tax revenues. This has been the experience again and again in localities in the city where modern parkways and expressways have been built. 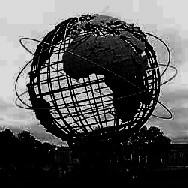 The Grand Central Parkway and the Belt Parkway have produced these results, and it is now happening along the Long Island Expressway. There is every reason to expect that it will also happen in the case of the Lower Manhattan Expressway." 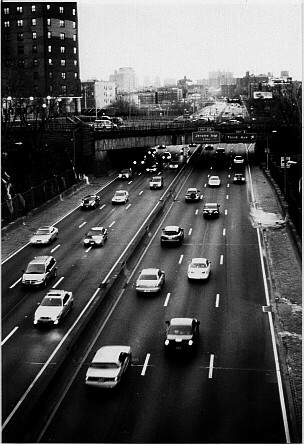 "the construction of the gowanus parkway, laying a concrete slab on top of lively, bustling third avenue, buried the avenue in shadow, and when the parkway was completed, the avenue was cast forever into darkness and gloom, and its bustle and life were forever gone." "one mile, the most expensive mile of road ever built, cost $40,000,000." "the proposed bridge anchorage in battery park... would be a solid mass of stone and concrete equal in size to a ten-story office building. the approach ramp linking the bridge to the west side highway... would actually be a road wider than fifth avenue, a road supported on immense concrete piers, and it would cross the entire park - the entire lower tip of manhattan island - and curve around the west side of the island almost to rector street at heights ranging up to a hundred feet in the air. not only would anchorage and piers obliterate a considerable portion of battery park, they - and the approach road - would block off much of the light not only from what was left of the park but also from the lower floors of every large office building they passed." 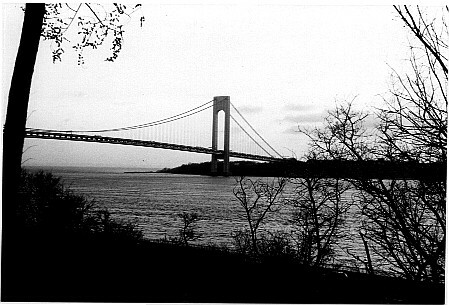 "no suspension bridge anywhere in the world would be as long (or expensive) as the verrazano-narrows bridge; it would be the longest such bridge ever built, its towers so far apart that in designing them allowance had to be made for the curvature of the earth: their tops are one and five eighths inches further apart than their bases. there would be enough wire in the verrazano's cables to circle the earth five times around at the equator or reach halfway to the moon, enough concrete in its anchorages to pave a single-lane highway reaching all the way from New York to Washington, and more steel in its towers - taller than seventy-story skyscrapers - and girders than was used in the construction of the empire state building." "the empire had its own flag and great seal, distinctive license plates and a self-contained communications network... triborough had its own fleets, of yachts and motorcars and trucks, and its own uniformed army"
"cities are created by and for traffic. a city without traffic is a ghost town."